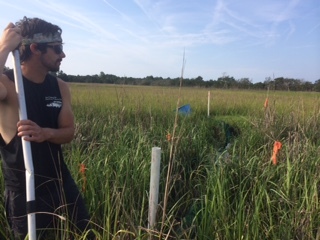 FundingFunding was made possible through scholarships from the Center of Integrative Conservation Research, and the Garden Club of America, grant money from the Georgia Department of Natural Resources Coastal Incentive Grant, and the U.S. Geological Survey. Field SupportLittle of this work could be done without the support of tireless field technicians. William (Will) Wood: Will graduated from North Carolina Sate University with a degree in Fisheries and Wildlife Sciences in 2011. He has worked with dragonflies in the sandhills of North Carolina, Trout in the Eastern Sierras. 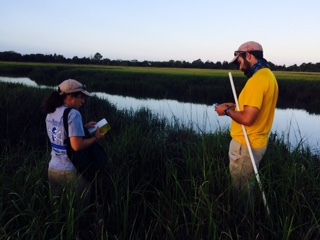 He is really enjoying sampling the salt marshes of Georgia. When he is not dodging sand bars and oyster beds during work, he enjoys surf and pier fishing for fish a little bigger than what we catch in the trawl! Katherine (Katie) Markowitz: Katie received her bachelors in Marine and Environmental Biology and Policy from Monmouth University in 2013. She has worked as a wildlife technician on the New York City Department of Environmental Protection Waterfowl Management Program. She aspires to receive her Masters and work in fisheries concentration on the early life stages and development of fish. She enjoys reading and hiking in her spare time. Matt Bogaard: Matt graduated from the University of Iowa in May of 2013 with a B.S. in Aquatic Sciences and Fisheries. He worked on a field crew in Montana post graduation before coming to Georgia sampling habitat data in mountain streams for federally endangered species. Jace Nelson: Jace Nelson received his undergraduate degree from the University of Georgia. He is current pursuing his Masters degree studying fresh water mussel reproductive ecology at the University of Georgia. Katherine Gillman: Katherine received her undergraduate degree at Boston University in Biology. She is currently working in Peru with the University of Georgia as a field technician.